J.O. Spice now has a state of the art laser engraver for creating one of a kind custom crab mallets. This machine will produce top quality text and logo engravings on a variety of surfaces. Our specialty has always been custom designed crab mallets. 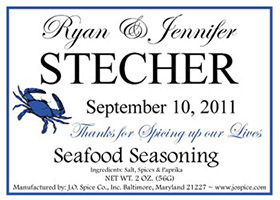 Personalized crab mallets have always been a hit anywhere steamed crabs are sold or eaten. These wooden custom mallets are perfect for large parties, corporate gatherings and events, weddings, golf outings or any restaurant that wants a crab mallet that will always be advertising their business. You will be surprised how affordable custom engraving can be. 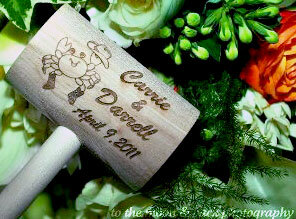 You and your guests or customers will love these personalized custom crab mallets. Call or email us today for a quote. Photos below show crab mallets engraved for a wedding reception as well as custom labeled seasoning that makes a great addition to any event. All Custom Designed! 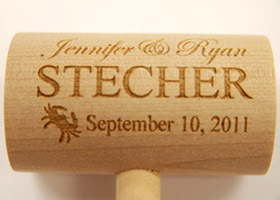 CLICK HERE for more samples of custom engraved crab mallets, personalized mallets, pre-printed mallets and more for weddings, birth announcments, parties, fundraisers, corporate outings and more. DISCLAIMER: Our mallets are a natural wood product and as a result the grain my vary. This will cause a slight difference in the way the laser engraves each mallet. Some mallets will be lighter than others as a result of this. We have done custom engraved mallets and other items for customers all up and down the East Coast including Maryland, Washington DC, Virginia, Pennsylvania, Delaware and more. We can also ship engraved products anywhere in the United States.